WHY RECYCLE IN THE FIRST PLACE? WHAT CAN BE RECYCLED? REDUCED? REUSED? WHEN DO I THROW THINGS AWAY? "Reduce, Reuse and Recycle." It's an old adage I remember hearing in school, or at the very least on some well-intentioned, but not knock-your-socks-off interesting, episode of Captain Planet. Regardless of where I heard it, one thing is very clear, recycling is DEEPLY entrenched part of Japanese culture. So knowing how to recycle is one of the essential, habitual skills you should know and understand if you're here. Luckily, Japan makes recycling so much easier than you think. It's for damn sure way easier than it was for me in my good old state of Georgia in the US of A. In this guide I'm personally going to walk you through recycling basics. How to recycle paper, plastic, discard oversized garbage, cardboard, and more. If there are sections that you need to skip to, use the table of contents above to do a bit of "just in time" learning. I remember being a bright-eyed, kid, trying to recycle in my hometown as a kid. The result? Lots of laughter, eye-rolling, and sighs. Back then, finding a recycling bin in Decatur, Georgia was like trying to find a cell phone in the early 90's, you heard about 'em but you never really saw 'em. Finding places was to recycle was one major issue, the other issue was that the city services weren't set up to do it. More than likely, the things you were recycling were probably going straight from recycle bin to land fill. Though I can't speak for other countries, Landfills were...are?...America's DEEPLY entrenched waste management system. Ever heard the Japanese expression “Mottainai?” (勿体無い, もったいない). This handy dandy expression Japanese expression that means “wasteful.” Or in a round about way, "don't be wasteful." When we talk about disposing of Mottainai has a similar feel to three R's with one small difference...people in Japan actually pay attention to it! This is a million dollar, devil's advocate question...but it's fair one. What's the point? In America, I eventually gave up on trying because it proved to be way too time consuming and way too difficult to do on my own. But here in Japan, it's different. Recycling here in Japan only takes slightly more effort than throwing something away. I think the powers that be know that it's a necessity and pretty much all barriers to entry have been removed. No excuse, people! REASON 2: This ain't America! Being that Japan is a smaller country than many, the indiscriminate trash-dumping that you might find in many American households isnʼt much of an option here. Consider this, the US has a population of over 324 million people and 50 nifty states to hold them all. Japan has a smaller population 126 million people (still pretty substantial) and houses them in a land mass smaller than the state of California! It's way more densely packed than the US will ever be. This explains so much about the culture. People live in smaller homes, use more public transportation and live off of less because they have to. 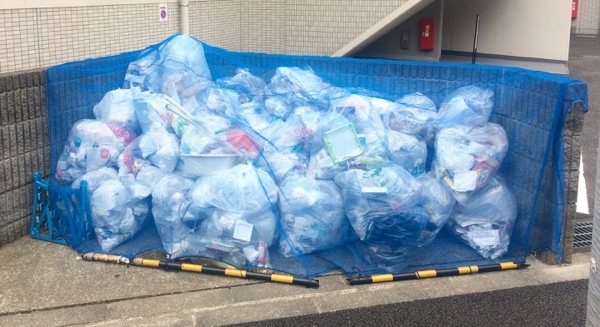 Since there are fewer places to put landfills, what on earth do people do with their trash here in Japan? The vast majority actually recycle their garbage. Interesting, right? I swear I'm not getting on my soap box here. I've can't point fingers any more than the average Joe or Jill. But in a place where there's less space, people have to be a bit more (just a bit) conscious of how they consume and the waste they create. If Japan adopted some of the "Well, someone else will take care of it" practices you see in so many American cities...this place would be in trouble fast. One of my biggest fascinations/semi-culture shocking things that I found when I got here was that a number of Japanʼs citizens taking pride in the environment around them, maybe without even realizing it. Recycling is just one of those things that people habitually do here. But don't get this confused, there are seedier parts of town where people just don't care at all. Nearly every single item that you consume or discard can be recycled. Even when you can't recycle it, how can you reduce the waste you're making? What stuff can be reused? Take a moment to think about the foods you eat regularly. What kind of containers does that food come in? Most likey the containers that food comes in are made of paper, plastic, or something similar. Here in Japan, just taking a closer look at those packages let's you now that most of the items you consume can be recycled. In addition to the items you use on a daily basis, think about some of those rare throw-away items (monitors, electronics, beds, etc.). Even these things can be reduced (into their component parts), reused, or even refurbished (hey! that's another "R" word 😀 ) . All of these leave some form of waste footprint. Japan has a pretty damn efficient system keeping this footprint as small as possible in a manner that's as efficient as possible. WHERE CAN I FIND RECYCLING BINS? TRASH COLLECTION SITES? OUT AND ABOUT - They're Just about everywhere! Next time you're out and about, see how many recycling bins you can spot. It's actually rarer for me to find a general trash can that it is a recycle bin. Often the bins will be labeled flammable garbage, nonflammable garbage, etc. Not all will be labeled in English, though. WHERE YOU LIVE - If you're in an apartment or a sharehouse, there should be a trash collection site very close to where you live. Some dead giveaways are netted areas on the side of the street, and caged areas or sheds near apartment buildings. With the netted areas, somedays you'll go outside to find that a neighborhood resident has already put out their trash in the right spot the night before. For those of you who live in the mansion-style housing (slightly more expensive housing with concrete construction, call boxes, etc. ), you may find that you have an actual waste disposal room that a groundskeeper manages and cleans. It's even easier for you! This is a typical recycling site here in Tokyo. This particular day is PET bottle, glass bottle (aka びん in Japanese), and can day. I want to say these must be standard collection collection containers distributed in each city. 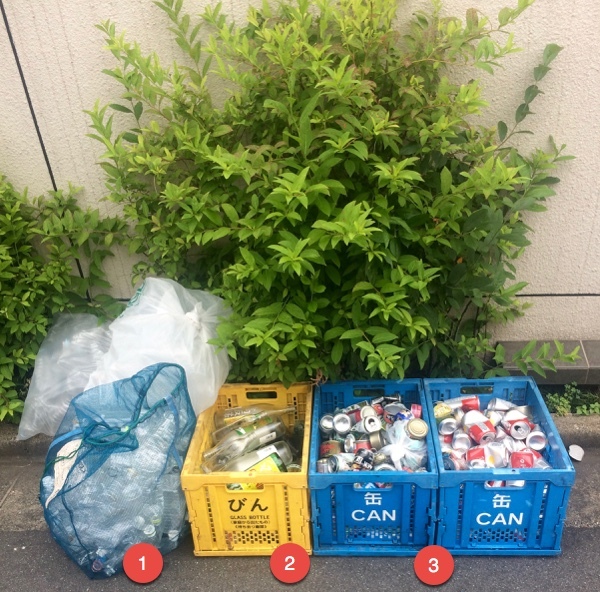 The blue plastic bag used for pet bottles (item #1), as well as the collapsible yellow and blue boxes (items #2 and 3) are the EXACT same here in Nerima-ku as they are in the neighboring ward of Nakano. Why does this site look so small? Because in this particular, quiet neighborhood there was loads of smaller recycling areas, making it much more convenient for the residents living there. ​If you're ever fretting about where to put your garbage...DON'T! The busier the city you live in, the more likely you'll see ample places to recycle the everyday things that you need to. WHAT ARE THE BLUE NETS FOR? 1) STABILITY - to hold large stacks of garbage bags (or recycled items) in place, to keep from moving or rolling into the street​. 2) ORGANIZATION - The blue nets make it easy for waste management services to spot and pick up. Donʼt worry this is also easier than you might think. When you move to a new city there is usually a waste disposal schedule you can pick up (for free of course) at your local city hall and in some cases on the city hall website. On this schedule (mine is both in English and Japanese), youʼll see exactly which days to take out which types of waste. For example, on this schedule burnable garbage goes out on Tuesdays and Fridays while non-burnable garbage goes out on every second and fourth Thursday, etcetera. Be extra aware of those burnable garbage and 生ゴミ - namagomi (food/kitchen scraps) days. I'm sure nearly every foreigner has run into that situation where you miss burnable garbage day and your apartment ends up smelling like the “Bog of Eternal Stench” until the next day comes burnable day comes around. 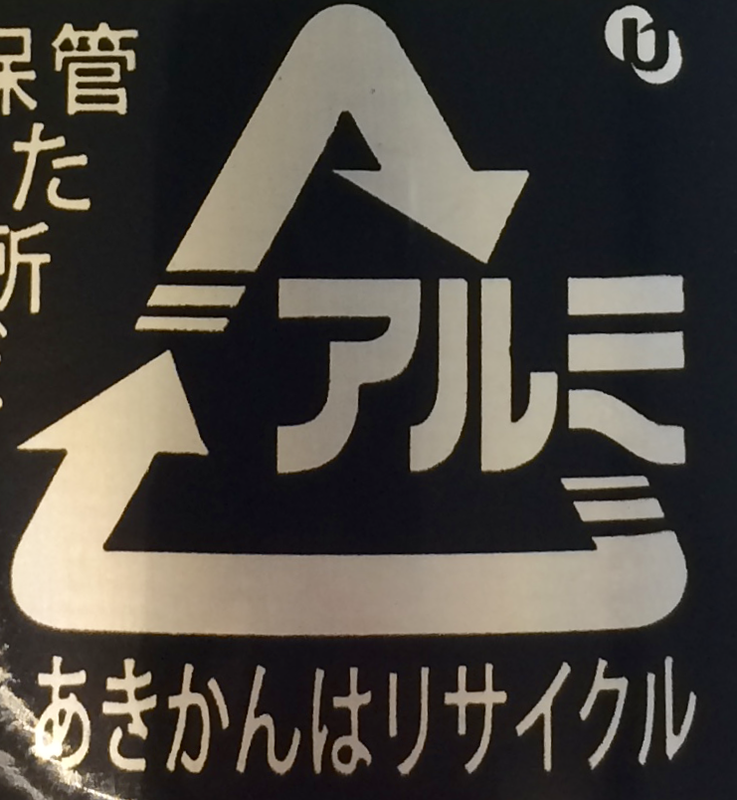 You'll generally find this recycling symbol on cans. The characters 「スチール」- SUCHI-RU is katakana pronunciation for the word "steel" in English . Interesting, huh? You can see particular recycling sign, on the backs of certain kinds of cans, too, namely soda cans. The characters you see are「アルミ」"A-RU-MI" which is Japanese katakana shorthand for "Aluminum." Yep, you may have already guessed it on this one. 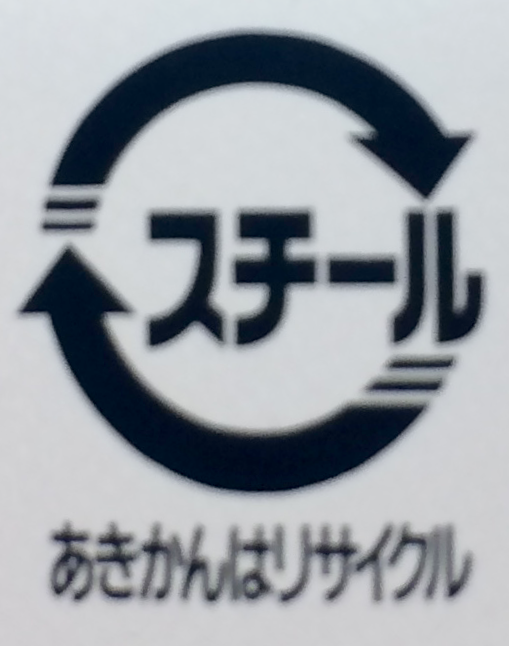 This symbol for plastic is also a foreign, katakana loan word for the English word "plastic." In this case it's another abbreviation プラ - Pura which is short for プラチック or Purasuchikku (sound it out and it'll sound way more like the word than how it looks). 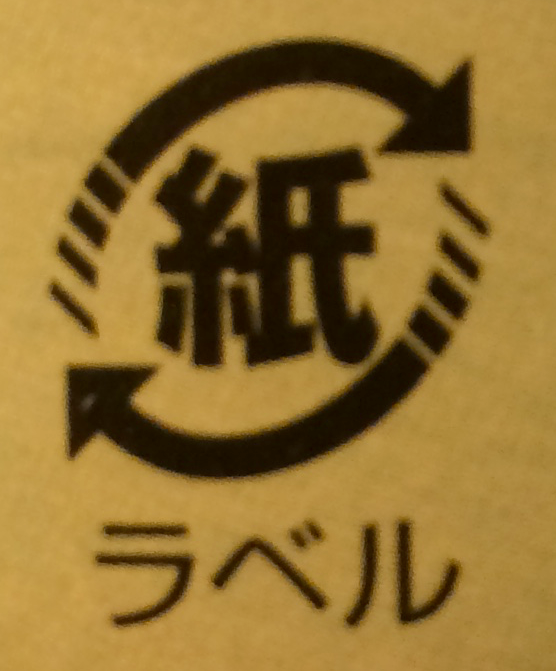 This symbol breaks from our katakana mold a bit. 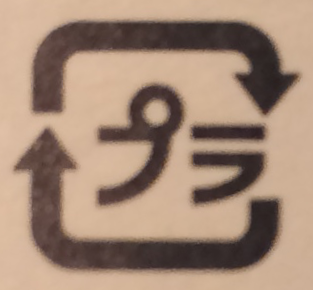 When you see this symbol on an item it means "paper," denoted by the Japanese kanji "kami." The perfect place to see this symbol...MILK CARTONS! And this one, is straightforward English abbreviate for for Polyethylene terephthalate. I guess it'd be a little cumbersome to write that entire word on every bottle, so PET is much shorter and much easier for people to use. ​I'm kicking off the how to section of this guide with PET bottles as they are one of the most common types of waste that accumulate and one of most common recycle bins you'll see around Japan. One reason PET bottles are so common is because the Land of the Rising Sun is like vending machine central, especially in your more populous cities. When you walk through a number of train stations, namely ones on the Japan Rail, it's pretty easy find a drink machines (not always but most times). Man machines have a recycle bin housed right next to machine. You'll see a hole for pet bottles and sometimes for glass ones, too. Feels like they've even thought of the little things ​with recycling here. If you look at any PET bottle (I have yet to find an exception), there is a section of the label that shows you where you can peel the label. The labels will have either a partial label that uses a bit of adhesive or a full label that's perforated on one side. When you're recycling things, you very well may see bottles tossed into recycle bins with caps still screwed on and labels still attached. This is a lazier approach to recycling, but making the attempt is better than no attempt at all in this case. However, the recommended method by nearly every recycling pamphlet i've ever seen is to remove both the cap and label.​ For this guide, let's focus as best we can on how to recycle things properly. Cans and glass bottles generally have fewer pickup days than say plastic or burnable garbage, so try to be mindful of that if you can. But here are the three easy steps to recycling cans. Discarding plastic is one of the easier ones. Simply look for the trusty plastic, recycle symbol and discard into a non-burnable waste/recycle bin. If it's plastic that you've eaten with, or eaten out of, it's a great general rule to rinse and drain the items before discarding them. With plastic it's not difficult process, but as we mentioned earlier, knowing the right day to dispose things is really important. STEP 2: If you have multiple boxes, stack and tie them together using twine or something similar (you can find this at a 100 yen store fairly easily). Tie the boxes in a patter almost like ribbons on a gift. Paper and magazines follow a very similar process to cardboard and corrugated boxes. When we're talking paper in this case, we don't mean regular, burnable garbage as that is one of the items (in addition to things like food waste) that actually gets discarded. STEP 2: Place your items in the appropriate recycling area. ​This is one of those lesser known things here in Japan. When you have a large item that can't be picked up using a normal waste disposal truck. You do have to go through a bit more work. STEP 1: You have to contact your local city hall's waste disposal services to arrange pickup. If you don't speak Japanese, it might be better to get a friend to help out. I have yet to do this in English. STEP 2: Go to your local convenience store to pick up sodai gomi stickers. WHAT HAPPENS TO ALL THIS STUFF, ANYWAY? This is where my knowledge gets a little fuzzy. However, I do know that the recycled items that go get picked up aren't getting the bait and switch treatment. They're not going to landfills. How do I know? I had a chance to visit a recycling center,but only for a short time. I was moving to a new apartment and missed the deadline to throw out one of my oversized items (I think it was a mattress). Anyway, a Japanese friend with an sports utility vehicle offered to drive me to the recycling center to deliver the item directly. This may be a useful not for those of you with oversized garbage items. 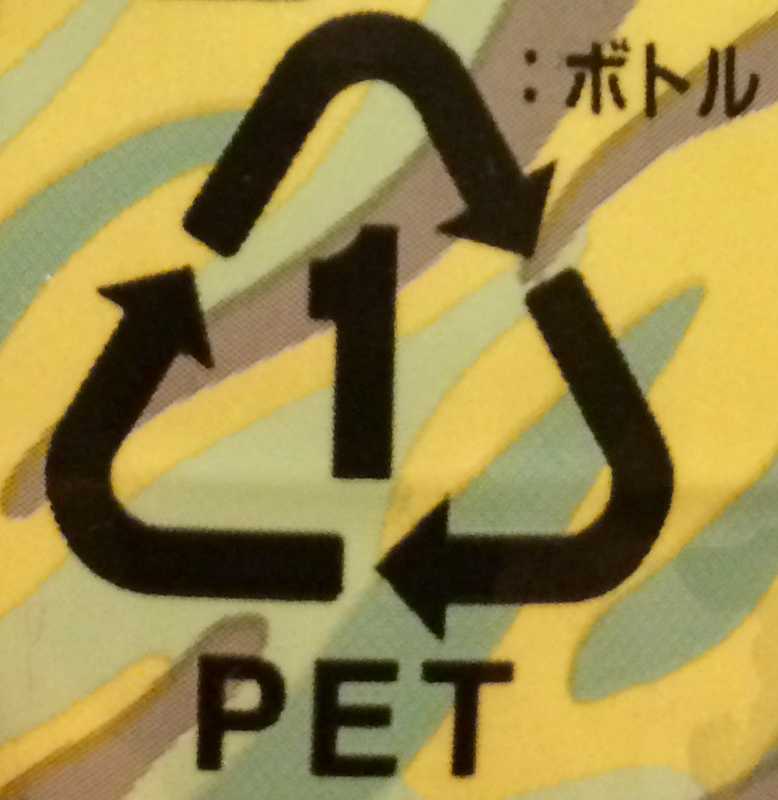 GOT JAPAN RECYCLING TIPS YOU WANT TO SHARE? The comments section is all yours! Got any tips or advice on recycling here in Japan? We'd love to hear them! I truly want to make this guide as comprehensive and as helpful to people as humanly possible. In order to do that, I need to go beyond my own knowledge. Sharing your thoughts, your stories, your pictures, your questions...ALL OF IT...might just help somebody you don't even realize. Please comment and share away.